Nick Dal Santo and Emma Kearney joined Hampton Rovers players recently to celebrate a great partnership and an exclusive new deal for club members and supporters. 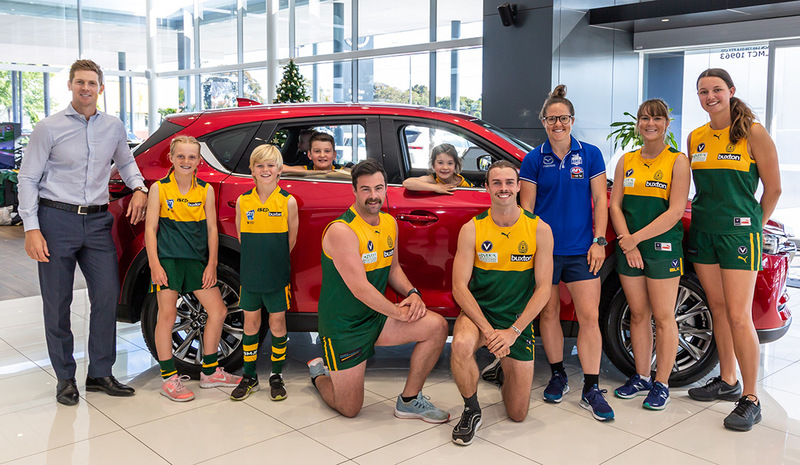 Brighton Mazda continues as a major sponsor of the Hampton Rovers Football Club in 2019 and if you’re in the market for a new car, we encourage you to consider Brighton Mazda and visit the dealership on Nepean Hwy. Ensure you mention the Rovers to secure a good deal. Additionally, the club is pleased to promote the Mazda Corporate Select Program. If you have some pull in a 50+ employee company, this deal could benefit you and the Rovers. The Mazda Corporate Select Program is an employee benefits program and offers additional value designed to target the private buyer along with buyers who have the ability to purchase a vehicle through their employer with a novated lease. Mazda Corporate Select will provide eligible purchasers the additional value of 40,000km/4 years of complimentary scheduled servicing on any eligible vehicle. Exclusive to Brighton Mazda, every purchase will secure additional funds for the Hampton Rovers Football Club on top of the existing sponsorship. View full details in this PDF. We thank Brighton Mazda for their ongoing support and look forward to a big 2019!